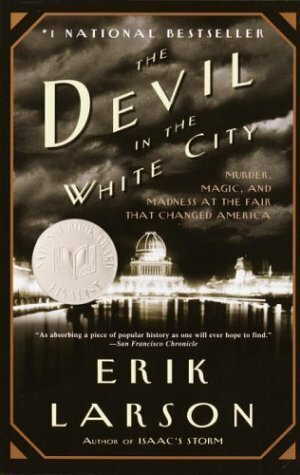 Synopsis: Author Erik Larson imbues the incredible events surrounding the 1893 Chicago World's Fair with such drama that readers may find themselves checking the book's categorization to be sure that 'The Devil in the White City' is not, in fact, a highly imaginative novel. Larson tells the stories of two men: Daniel H. Burnham, the architect responsible for the fair's construction, and H.H. Holmes, a serial killer masquerading as a charming doctor. Burnham's challenge was immense. In a short period of time, he was forced to overcome the death of his partner and numerous other obstacles to construct the famous "White City" around which the fair was built. His efforts to complete the project, and the fair's incredible success, are skillfully related along with entertaining appearances by such notables as Buffalo Bill Cody, Susan B. Anthony, Nikola Tesla and Thomas Edison. The activities of the sinister Dr. Holmes, who is believed to be responsible for scores of murders around the time of the fair, are equally remarkable. He devised and erected the World's Fair Hotel, complete with crematorium and gas chamber, near the fairgrounds and used the event as well as his own charismatic personality to lure victims. About the Author: Erik Larson, author of the international bestseller Isaac's Storm, was nominated for a National Book Award for The Devil in the White City, which also won an Edgar Award for fact-crime writing. His latest book, In the Garden of Beasts: Love Terror and an American Family in Hitler's Berlin, has been acquired for publication in 20 countries and optioned by Tom Hanks for a feature film. Erik is a former features writer for The Wall Street Journal and Time. His magazine stories have appeared in The New Yorker, The Atlantic Monthly, Harper's and other publications. Review: A riveting look into America's first serial killer, 'The Devil in the White City' is a great read for murder buffs, historians, and serial killer enthusiasts. Well written, and not as dry as one would expect a true crime book to be, Erik Larson gives the reader a view into more than just Dr. Holmes and his deadly hotel. The World Fair was a major landmark in American history, and the cameos by notables of the time only enhance the feeling that you are watching event unfold.